America & Europe’s leading television brand is now in India.Backed by cutting-edge technology and a timeless spirit of innovation, Funai brings a stellar product range to India. From Television sets and Home Theatre Systems to Blu-Ray and DVD players, accessories and much more.Funai’s product range brings to you a whole new world of entertainment and features to revolutionise the consumer electronics industry in India. 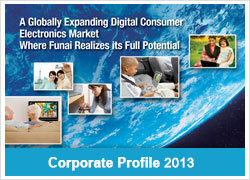 Funai Electric provides the market with reasonably priced, high-quality digital consumer electronics. In recent years, despite growing demand in the digital consumer electronics market, intense competition continues to drive product prices downward. However, we believe that this intense price competition also presents us with an opportunity to fully realize our potential. Since our founding in 1961, we have held an innovative return to the basics as important, and Funai will renew its focus on speed in all of its business activities. We will expeditiously develop products based on a swift and accurate perception of market and customer needs. 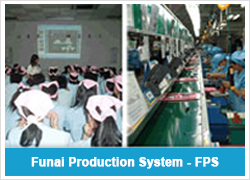 Furthermore, we will provide timely products that are superior in terms of cost performance through our proprietary production system, the Funai Production System (FPS), and the optimization of production facilities. High-Quality and Reasonably Priced Products for the World. Developing the Audiovisual Equipment, Information Equipment and Others Businesses, we provide high cost performance and high-quality products through a diverse range of brands to global markets. Funai aims to further improve competitiveness amid upheaval in the digital consumer electronics industry. In addition to enhancing quality and cost performance ever since the Company’s establishment, our strength lies in our exceptional supply capabilities, and we have earned an enormous amount of trust throughout the digital consumer electronics industry as a result. At present, our strengths are in three areas, Audiovisual Equipment, which handles LCD TVs and DVD and Blu-ray Disc-related products, Information Equipment, which handles printers and the Others Business, including DX ANTENNA CO., LTD., which handles receiver-related products. 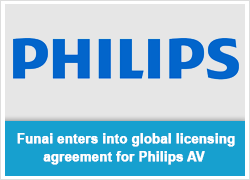 Audiovisual Equipment, our main business, provides the market with six brands of compact to large LCD TVs sold in Japan and overseas, and has a full line of Blu-ray Disc-related and other products. The reasonable price and high quality of these products has been well-acclaimed domestically and overseas, particularly in the North American market, where we proudly maintain a top share. In the Information Equipment area, we are strengthening partnerships with OEM* customers in an attempt to expand sales and earnings. The digital consumer electronics industry is going through a period of great upheaval. In terms of functionality, design and price, South Korea, China and Taiwan are rapidly becoming increasingly more competitive. However, this situation also presents us with an opportunity to fully realize our potential. Funai will attempt to increase its brand value and share by providing the market with reasonably priced products developed and produced quickly in response to the various needs of consumers around the world. * The manufacture and provision of products under the customer’s brand.